In The Mystery of the Periodic Table, the first part of Wiker's witty and solidly instructive presentation is most suitable to middle school age, while the later chapters are designed for ages 12-13 and up, with a final chapter somewhat more advanced. Fold-out Periodic Table. Black and white illustrations. 2003 copyright by Bethlehem Books. 5.5 x 8.5 inches. Soft cover. 166 pp. Archimedes and the Door of Science is a history/science novel from Bethlehem Books. Jeanne Bendick, through text and pictures, admirably succeeds in bringing to life the ancient Greek mathematician who enriched mathematics and all branches of science. Against the backdrop of Archimedes's life and culture, the author discusses the man's work, his discoveries and the knowledge later based upon it. The simple, often humorous, illustrations and diagrams greatly enhance the text. Includes an introduction by Laura M. Berquist, and an index of terms. Recommended for grades 6-8. Black and white illustrations. 2001 copyright. Originally published by Franklin Watts, Inc.1962. 5.5 x 8.5 inches. 142 pp. Galen and the Gateway to Medicine is about Galen, a physician born in 129 A.D. at the height of the Roman Empire. Galen’s acute diagnoses of patients, botanical wisdom, and studies of physiology were recorded in numerous books, handed down through the Middle Ages and Renaissance. Not least, Galen passed on the medical tradition of respect for life. 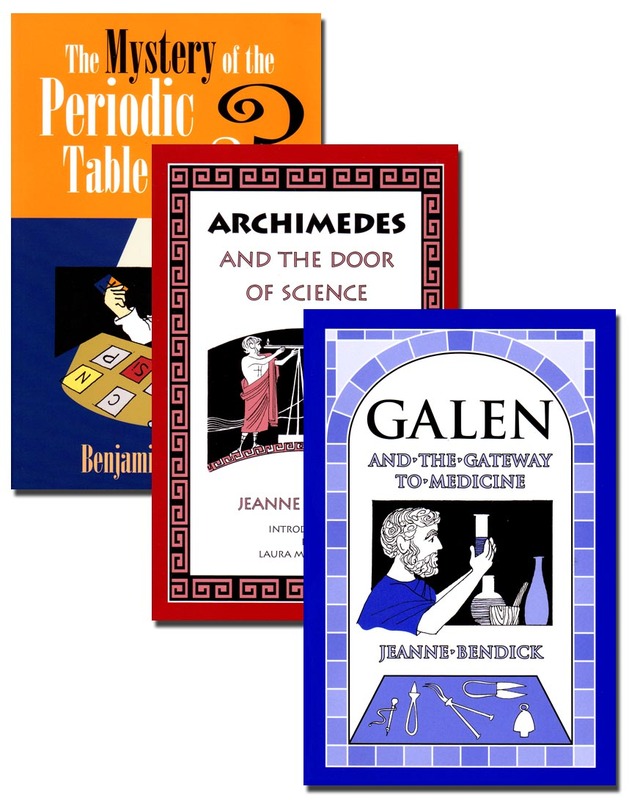 In this fascinating biography for young people, Jeanne Bendick brings Galen’s Roman world to life with the clarity, humor, and outstanding content we enjoyed in Archimedes and the Door to Science. An excellent addition to the home and to the home-education library. 150 pp, Quality Softcover, Ages 9-up. Save $3.00 when buying the set of three books!